Columbia Precast Products manufactures catch basins to enhance the infrastructure of public and private projects. Our products are often the starting point of a storm-drain system that keeps roads from flooding and prevents standing water from accumulating. Catch basins and inlets are a key component of underground drainage systems. We manufacture precast concrete catch basins in our Southwest Washington plant. Precast concrete is a resilient, sustainable, and economical material. 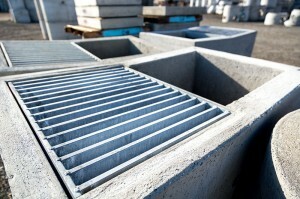 Precast catch basins are the most popular storm drainage product on the market. You’ll find them in cities and towns across the Pacific Northwest and the rest of the nation. These resilient and durable products are ideal for the drainage demands of Washington and Oregon. Columbia Precast Products produces a variety of standard designs to suit a range of applications. If you need a site-specific shape, size or configuration, our engineers work with you to create a suitable product. With a proven 100-year service life, precast concrete catch basins are a long-term solution to stormwater and drainage problems. And, because concrete is a natural material, precast products are a safe and sustainable choice. Catch basins, often called inlets, prevent flooding from rain and melting snow. During rainy winters, Washington and Oregon can be hit with periods of heavy rain. In spring, snowmelt fills creeks and rivers, sometimes leading to excess water at lower elevations. A well-designed storm-water drainage system can handle most of Mother Nature’s extremes. Catch basins are part of the out-of-sight grid that keeps roads, sports fields, green spaces and parking lots properly drained. 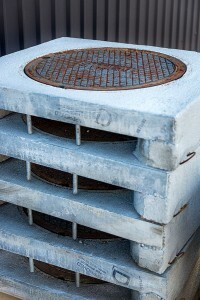 Most catch basins consist of a below-ground box or cylinder topped with a grate. The top of the structure usually sits flush with the ground. The soil may be graded so water can run toward an inlet placed at the site’s low point. Other designs are possible. Some catch basins process debris and sediment by incorporating a sump. Water drains from the basin through an outlet pipe. Our precast area drains are ideal for a wide variety of landscape drainage needs, including where high-flow capacity is required, such as in parks, golf courses and apartment complexes. Stormwater flow rate at peak times determines how many catch basins are needed for a given project. Factors affecting flow rate are the ground slope, average rainfall and the surface of the site. For example, a paved area requires manmade drainage since it won’t absorb water like soil does. The parking lot of an airport or mall may need at least a few catch basins to ensure water drains efficiently. Engineers or other planners determine the number, location and type of catch basins required. A catch basin contains a certain volume of water below an outlet pipe or elbow. Sediment may settle in this standing water. When that happens, oil from cars and other machinery may accumulate, floating to the top. Catch basins are designed to handle debris, oil and grease so long as the structure is maintained properly. A sump can capture debris and solids when water flow is low. Fine silt is more difficult to filter than larger particles. Regular maintenance of the catch basin and sump ensures the system remains efficient. Drainage systems work best when they’re frequently cleaned and maintained as needed. An industrial facility or site will likely require cleaning more often than a parking lot. You can reduce the debris that enters the system by removing pollutants, soil and other materials before they flow into the catch basin. Some basins may require oil absorbing strips to collect sediment. Filters must be cleaned or replaced as needed. Precast concrete products offer relatively easy installation when compared to poured-in-place concrete and other types of on-site construction. Placing a catch basin requires heavy machinery and expertise. Before installation, the ground must be excavated and prepared in other ways. If a catch basin is incorrectly installed, it won’t be effective and could develop problems with its structure. If the system as a whole is of poor design, a drainage problem might be transferred from one place to another. Installation of your system may require a backhoe, crane, excavator and rigging. Other required tools and materials include mastic or grout. A small crew can do the work. Before a finished catch basin can be placed, your team should get the site ready. In most cases, a basin sits at the lowest point in the field. Plot the entire system including the place where you want the catch basin. Mark the area, including where you’ll install pipes. Before digging, your team must ensure the location of underground utilities. Dig to the depth needed for the catch basin. Dig the hole large enough to ensure the proper amount of clearance for the precast structure. Prepare the hole with a bedding of gravel or sand. The base should be firm enough to prevent shifting and settling of the concrete product. Local specifications will guide the depth and compaction. 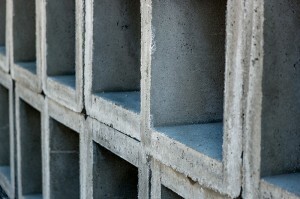 Some precast concrete products have several pieces. Install each part separately, joining as needed with mastic strips of grout. Be sure the alignment is correct before adding the next part. Fit the lid onto the basin and complete installation with backfill. Columbia Precast Products manufactures catch basins for Pacific Northwest stormwater drainage. We can customize products for nearly any type of project. Contact us today for more information.